5 Deparment of Interventional Cardiology, Targu Mures Emergency Institute for Cardiovascular Disease and Transplant, Romania. 6 Professor of cardiology, Faculty of Medicine, Lucian Blaga University Sibiu, Cardiology I Department, Research Center for Invasive and NonInvasive Cardiac and Vascular Pathology in the Adult, Sibiu Emergency Clinical Hospital. Contact address: Mădălina Urluescu,MD Cardiology Department, Sibiu Emergency Clinical Hospital, Corneliu Coposu Boulevard, 2-4, 550245 Sibiu, Romania. Takayasu disease, named also ”pulseless disease”, is an autoimmune systemic granulomatous vasculitis, with unknown etiopathogenesis, which is characterized by the impairment of the great vessels predominantly of aorta and emerging brances1. Young women are more prone to develop this pathology which is often developed in 2nd-3rd decades of life (fewer than 15% of reported cases developed the disease later than 40 years old)2. Despite the fact that it is a rare disease (incidence 2,6 persons/1 million/year) and is observed more frequently in Asian, Central and South America countries, we must not ignore it in formulating a differential diagnosis3. This is an inflammatory disease and the lesions produced can be stenotic, occlusive or aneurysmal4,5. We report a case of Takayasu disease and the difficulties in approaching this pathology. We present a case of a 36 years old patient, female, from rural environment, known in history with: grade III hypertension and high cardiovascular risk since the age of 28; repetitive paroxysmal supraventricular tachycardias; obesity; ischemic stroke at 32 years old; with repeated hospital admission in various medical services in our country and in Italy. She comes at the emergency service from Sibiu for high levels of blood pressure (BP: 230/115 mmHg at the right arm), phenomena of hypertensive encephalopathy and mild chest pain, being sent to the Cardiology Department where she is hospitalized. On examination, the relevant elements observed were: obesity, the impossibility of measuring blood pressure and the absence of pulse in the left upper limb, warm skin and rich superficial venous circulation at this level (Figure 1), second grade systolic murmur in the mitral area, no murmurs on the large vessels, right hemiparesis with mild hypotonia, horizontal nystagmus. Figure 1. Rich superficial venous circulation at left upper limb. Figure 2. Chest radiography showing a left lower elongated heart archery and a much enlarged upper mediastinal opacity. On the ECG we observed sinusal tachycardia (106 bpm), LVH. The echocardiography revealed morphologically normal aortic valves, a minor mitral and aortic insufficiency, LVH, aneurysm of ascending aorta, aortic arch and descending aorta (ascending aorta: 40 mm; aortic arch: 50 mm; descending aorta: 53 mm), with the absence of the Doppler flow on the left subclavian artery, without turbulence in the descending aorta characteristic for aortic coarctation. Laboratory tests found a significant inflammatory syndrome (ESR: 80 mm/1h; C reactive protein: 30; fi brinogen: 512 mg/dl), mild hypochromic microcytic anemia. 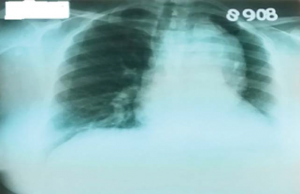 Chest radiography (Figure 2) revealed a left lower elongated heart archery and a much enlarged upper mediastinal opacity, raising suspicion of aortic aneurysm. Imagistic explorations were complemented with the chest CT angiography (Figure 3, 4) which revealed an aneurysm of the ascending aorta (40 mm), of the aortic arch and of the fi rst segment of descending thoracic aorta with a diameter of about 55 mm for a length of 20 cm, without signs of dissection; occlusion of the left subclavian origin artery: thickened vascular walls of the left carotid and along the entire dilated aorta; swelling of the brachiocephalic trunk and left carotid; king-king of descending thoracic aorta at intervertebral space T8-T9 without damaging the lumen, rich cervico-thoracic, mediastinal and pericardial collateral circulation; arterio-venous shunts between pericardial vessels and the cava vein: small infrarenal aortic aneurysm; significant concentric LVH. Ocular fundus revealed hypertensive retinopathy. Figure 3. Computed tomographic angiography images (A, B, C) showing aneurysm of the ascending aorta, of the aortic arch and of the first segment of descending thoracic aorta, king-king of descendent thoracic aorta at T8-T9 intervertebral space, occlusion of the left subclavian origin artery, rich cervicothoracic, mediastinal and pericardial collateral circulation; arterio-venous shunts; small infrarenal aortic aneurysm. Figure 4. Computed tomographic angiography images of the chest, transversal section, showing LVH (A), aneurysm of the ascending aorta, of the aortic arch and of the first segment of descending thoracic aorta, thickened vascular walls and rich collateral circulation (B, C). rheumatoid factor, AntiSm, AntiRo, antibodies and lupus cells were negative. Correlated with clinical examination and other investigations, we have excluded lupus, sarcoidosis and rheumatoid arthritis. Given the clinical and laboratory examinations and considering the fact that we have 4 ACR criteria (Table 1), 1 major (left subclavian artery occlusion) and 6 minor Ishikawa criteria (ESR >20 mm/1h; hypertension; aortic regurgitation; aortic aneurysm of the ascending aorta, of the aortic arch and of the first segment of descending thoracic aorta; thickened vascular walls of the left carotid artery and along the entire dilated aorta), we diagnose the patient with Takayasu disease type IIb according Numano classification.The feminine gender is another important element, given that 80-90% of cases with Takayasu arteritis are women. High inflammatory syndrome highlights the active stage of the disease. Given the high values of blood pressure, the antihypertensive treatment was immediately initiated with a drug combination of perindopril 10 mg/day and indapamide 2.5 mg/day, adding a beta-blocker (bisoprolol 5 mg/day) and antiplatelet (clopidogrel 75 mg/day), taking into account the presence of the aneurysm. At the indications of the rheumatologist, the therapy with methylprednisolone was initiated with 48 mg/day (indication according to national guidelines regarding primary systemic vasculitis being 1 mg/kg/day prednisolone up to 60 mg/day), at usual doses in active vasculitis, unfortunately diagnosed at a late stage in the present case (stage complications). The treatment was completed after 2 weeks in Cluj Napoca Clinical Rheumatology Emergency County Hospital, with methotrexate (20 mg/week) and folic acid, the doses of methylprednisolone being increased to 64 mg/day (following that doses gradually decrease monthly) because the disease is considered severe by biological activity (important nonspecific inflammatory syndrome, ESR still high-90 mm/1h despite already initiated corticotherapy and increased C-reactive protein), by the presence of complications (left subclavian artery obstruction, giant aneurysm of thoracic aorta and stroke in the young woman) and life-threatening (already having important consequences prognosis about quo ad sanationem, quo ad laborem and quality of life). Severe hypertension, impaired fasting glucose, obesity, suggested reducing corticosteroid therapy as soon as possible, leading to 32 mg/day (one month later) for limiting possible side effects. Thus, the combination of immunosuppressive as early as possible, is one more time justified, given the high activity of the disease and due to preparing for potential vascular surgery which require low doses of corticosteroids and reduced disease activity for a higher rate of success. The most effective, according to the actual data, are anti-TNF alpha and antiIL6 but they are not available. Cyclophosphamide and azathioprine have greater toxicity and require better adherence to therapy (in the case of our patient collaboration was often difficult), so Methotrexate was preferred for simple dosage, moderate long-term toxicity and easy tracking. It was quickly associated because its effect installs in 8-12 weeks. Unfortunately, despite the efforts, the patient was not compliant because she has discontinued corticotherapy and the treatment with methotrexate for her own initiative after 6 weeks. Considering the fact that we are dealing with a young hypertensive patient with associated comorbidities, it raises the question of etiology elucidation of these disorders. Measuring blood pressure in both arms is very important considering the fact that, its absence at the left arm wasn’t noticed in our patient, despite repeated presentations to hospital in our country and in Italy. Hypertension is most probably essential, the patient having in her family history a fi rst degree hypertensive mother. However, the king-king of descending thoracic aorta or reducing compliance of aorta through the infl ammation processes and secondary fibrosis (which occurs frequently in the chronic phase by affecting all 3 layers and lymphocytes infi ltration, occasional giant cells, mucopolysaccharides, smooth muscle cells and fibroblasts or by elastic tissue destruction) could be the causes of secondary hypertension in this case. Rich presence of collateral circulation is an adaptive response to chronic ischemia caused by occlusion of the left subclavian artery14,17. Rich pericardial circulation may reveal coronary disease that could not be excluded because the patient refused angiography. Such collateral vessels which limits ischemia, plays an important role in maintaining the blood supply in the affected tissue. In Takayasu arteritis specific immunological markers don’t exist therefore, inflammatory syndrome determination is important for assessing disease activity. Recent studies have investigated different biomarkers (matrix metalloproteinases, Il-6, Il-18, serum amyloid A) but none is sufficient for disease diagnosing and monitoring13,16. In cases where the progression of the disease is fast and extensive, with inappropriate fibrosis, the formation of aneurysms appears. The detection of aneurysms in Takayasu’s disease is described in literature in 6-9% of the cases, often after 40 years18. The most common locations are the ascending aorta, abdominal aorta, the thoracic descending aorta being much less described15. Uncontrolled long-term hypertension, was observed in all patients presenting aortic aneurysms. The annual risk of aneurysmal rupture is relatively low, ranging between 1 and 7% but hypertension must be aggressively approached in these patients18. Given the large aneurysmal dilatation of the aortic arch and descending thoracic aorta (55 mm), the question was of performing surgery or thoracic aortic repair by endovascular approach (TEVAR) using stent-grafts. Occlusion of the left subclavian artery may benefit from subclavicular – carotid bypass if neurological symptoms appear due to vertebrobasilar suffering. However, any intervention was postponed considering the state of disease activity and because we couldn’t complete the remission treatment, the patient being noncompliant. Considering the presence of numerous complications, we proposed monitoring by a cardiology checkup at every 3 months. Given the fact that our patient has many complications and she refused to follow any treatment, she hasn’t had a good prognosis since, according to Park et al., the 10 years survival rates are approximately 36% in the cases 2, 6. It is very important to assess disease activity, given the presence of vascular complications which place the disease in chronic phase, evidenced by relapses and remissions10,12. CT scanning, MRI (where parietal edema can be a sign of disease activity) and angiography evaluate well the extend of the disease but recent studies suggest that, 18F-fl uorodeoxyglucose positron emission tomography allows diagnosis of Takayasu arteritis earlier in the disease course and appreciates better the disease activity5,7-9. Pentraxin 3 is also a biomarker for identifying disease activity, which seems to be more accurate than erythrocyte sedimentation rate and C reactive protein (which can be increased to 50% in the patients in the chronic phase of the disease and 70% in the active phase)11,12. Takayasu’s disease is a rare pathology that can be easily overlooked as a diagnosis if you do not insist on a thorough clinical examination and search possible causes in young hypertensive patients. Early and appropriate administration of the treatment accompanied by lifestyle changes and patient adherence may improve the prognosis and obtain disease remission. Conflict of interest: none declared. 2. Park MC, Lee SW, Park YB, Chung NS, Lee SK. Clinical characteristics and outcomes of Takayasu’s arteritis: analysis of 108 patients using standardized criteria for diagnosis, activity assessment, and angiographic classification. Scand J Rheumatol. 2005 Jul-Aug. 34(4):284-92. 3. Abularrage CJ, Slidell MB, Sidawy AN, Kreishman P, Amdur RL, Arora S. Quality of life of patients with Takayasu’s arteritis. J Vasc Surg. 2008 Jan. 47(1):131-6; discussion 136-7. 4. Phillip R, Luqmani R. Mortality in systemic vasculitis: a systematic review. Clin Exp Rheumatol. 2008 Sep-Oct. 26(5 Suppl 51):S94-104.5. Maksimowicz-McKinnon K, Clark TM, Hoffman GS. Limitations of therapy and a guarded prognosis in an American cohort of Takayasu arteritis patients. Arthritis Rheum. 2007 Mar. 56(3):1000-9.
for the classification of Takayasu arteritis. Arthritis Rheum. 1990 Aug. 33(8):1129-34. 7. Miller DV, Maleszewski JJ. 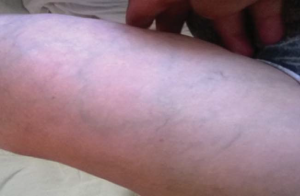 The pathology of large-vessel vasculitides. Clin Exp Rheumatol. 2011 Jan-Feb. 29(1 Suppl 64):S92-8. 8. Direskeneli H, Aydin SZ, Merkel PA. Assessment of disease activity and progression in Takayasu’s arteritis. Clin Exp Rheumatol. 2011 JanFeb. 29(1 Suppl 64):S86-91. 9. Ragab Y, Emad Y, El-Marakbi A, Gheita T. Clinical utility of magnetic resonance angiography (MRA) in the diagnosis and treatment of Takayasu’s arteritis. Clin Rheumatol. 2007 Aug. 26(8):1393-5.
shock protein-65 and its human homologue in Takayasu’s arteritis. Clin Exp Immunol. 2004 Dec. 138(3):547-53. 11. Dagna L, Salvo F, Tiraboschi M, et al. Pentraxin-3 as a marker of disease activity in takayasu arteritis. Ann Intern Med. 2011 Oct 4. 155(7):425-33. 12. Gornik HL, Creager MA. Aortitis. Circulation 2008;117:3039–3051. 14. Bulent Uzunlar, Ahmet Karabulut, Zeki Dogan, Mahmut Cakmak. Coronary-carotid artery collateral formation in Takayasu’s arteritis. First reported case in the literature. Journal of Cardiology Cases Volume 9, Issue 4, April 2014, Pages 151–153. 15. Clemente G, Hilário MO, Len C, Silva CA, Sallum AM, Campos LM, Sacchetti S, Santos MC, Alves AG, Ferriani VP, Sztajnbok F, Gasparello R, Oliveira SK, Lessa M, Bica B, Cavalcanti A, Robazzi T, Bandeira M, Terreri MT. Brazilian multicenter study of 71 patients with juvenileonset Takayasu’s arteritis: clinical and angiographic features. Rev Bras Reumatol. 2016 Jan 19. 18. Guido Regina, Domenico Angiletta, Alessandro Bortone, Martinella Fullone, Davide Marinazzo and Raffaele Pulli. Aortic Aneurysms in Takayasu Arteritis. Diagnosis, Screening and Treatment of Abdominal, Thoracoabdominal and Thoracic Aortic Aneurysms, ISBN 978-953- 307-466-5, Published: September 12, 2011.